But wait, you can save more! Early Bird savings from March 15-March 18th. Save 10% on a $15 purchase or more with code: InBloom. Save 25% on $35 with code: BiggerBloom. How about some freebies too? Yeah, I thought you might like that 😀 Sign up for a free account and get over $40 in free product including the set of SVG cutting files shown below. If you already have an account, you will find the new product available in your library. Don’t miss Dollar Days at Lettering Delights, this is the time to stock up! Thanks for stopping by and til next time happy crafting! Fun Favors and a Freebie! I cut the favor box, banner and cupcake wrapper with my cricut, to see the entire banner please check out yesterdays post. The favor boxes were cut with my Cricut MAchine and SCAL software (on sale $15 off!) using the SVG file in the Pretty Favor Kit (printable versions are included in the kit too if you don’t have a cricut) and they were so quick to make! The best thing about these boxes is that they cut quickly. I get two 4"x5"x1.5" boxes from a 12"x12" paper. A bit of hot glue and the box is done! When the kids got home from school I let them fill the boxes with candy and favors! And now for your freebie, a quick to cut cupcake wrapper, enjoy! Click the preview to download. Be sure to check out the September Sale at Lindsay’s Stamp Stuff to save 30% on everything through Friday! Free Collage Sheet & 30% off Sale! “It’s the most wonderful time of the year…” No, not Christmas, back to school time! I decided to mark the last week before school starts in my neck of the woods with a big sale, everything in the Lindsay’s Stamp Stuff shop at MyGrafico is 30% off through Saturday! This card took minutes to make! 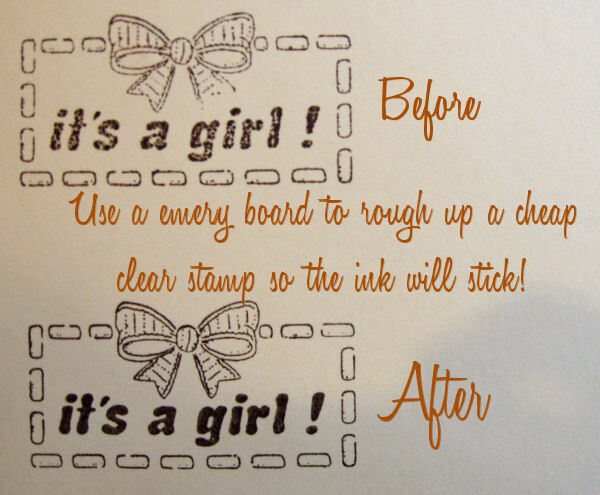 you could also use the idea for a belated birthday card and stamp "Happy Birthday & past due" on the library card! This box is about pencil box sized but you could make a mini slider box to fill with treats or candy! This is jut a fun tag made from leftovers, you could use it as a book mark or a backpack ID tag (you might want to laminate it first though:) This set qualifies for the following challenges: Creative Inspirations (bookmark), Cutie Sunday and HandStamp Creations and I Did IT creations and One Stop Craft Challenges (anything but a card), Double Dutch (make your own DP-Hey I designed all of the pattern paper-does that count? ), Frosted Designs and Lil Red Wagon (back to school), Gingersnap creations (red and black), Incy Wincy and Lollipop crafts (buttons/bows). Here is a look at the new sets at Lindsay’s Stamp Stuff this week, remember everything in my shop is on sale for 30% off through Saturday! Thanks for stopping by! Remember everything at Lindsay’s stamp stuff is 30% off until Saturday at midnight! Happy crafting! Fun Favors & a Freebie! I can’t get enough of die-cut boxes! I designed a new set this week called Fun Favors and used them in this set. I’ve had Christmas on the brain lately (maybe due to the warm weather we are having, I must really want to cool off:) so I also made a card with the Warm Winter digistamps from Lindsay’s Stamp Stuff. I colored the snowman with my prismacolor markers, since so much of it is white it was really quick (you could easily make a batch of these) and the “noel” label is from the pepermint holiday collection at Lettering Delights. I like to print up a sheet of sentiments and cut them apart as I need them, I used scraps leftover from making the boxes to decorate the card. This set qualifies for the following challenges: Our Creative Corner, Stamp Something (Christmas), Penny’s Paper Crafty(anything goes), TCP (use die cuts) and the sketch from a crafty little place. Here is a look at my new Fun Favors template set, you can cut them with a cricut and SCAL software or print them out (JPG) and cut them by hand, best of all both versions are re-sizable! Now here is your freebie, a cute milk carton! Tip: seal one end (of the top) but leave the other unglued so the box can be opened and shut without ripping. Click the pic to download. I converted clip art to a cutting file in scal and cut it after I printed it! The frame is by Cheri Wenger and you can find that at MyGrafico. Be sure to stop by tomorrow, we will have details about the Lindsay’s Stamp Stuff Hop, Shop & Crop! Til then happy crafting! Sew Pretty and a Freebie! I have been drawing up a storm this week and I have a few new sets out, on of which cooranates with the Sewing Stuff set, it is called Sew Pretty.